He will be great and will be called the Son of the Most High, and the Lord God will give Him the throne of His father David. He will be great and will be called the Son of the Most High, and the Lord God will give him the throne of his ancestor David. This man will be great, and will be called the Son of the Most High. 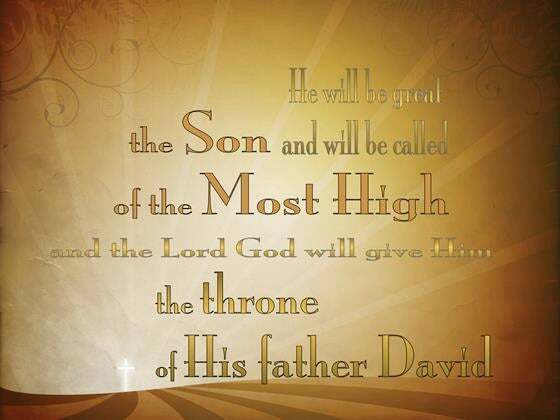 And the Lord God will give to him the throne of his father David. He will be great and will be called the Son of the Highest [i.e., God], and the Lord will give Him the throne of His forefather King David. He will be great, and will be called the Son of the Most High; and the Lord God will give him the throne of his father David. 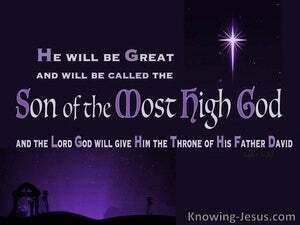 he shall be great, he shall be the son of the most high. the Lord God shall give him the throne of his father David. This one will be great, and he will be called the Son of the Most High, and the Lord God will give him the throne of his father David. 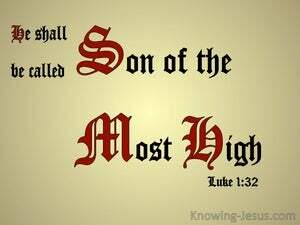 He shall be great and shall be called the Son of the Highest. And the Lord God shall give Him the throne of His father David. 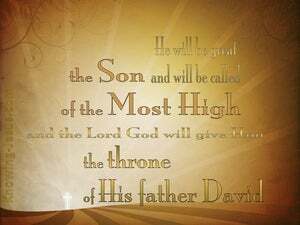 He will be great, and will be called the Son of the Most High, and the Lord God will give him the throne of his father David. He will be great, and will be called the Son of the Highest; and the Lord God will give to him the throne of his father David. 31 You will conceive in your womb and bear a son; and you are to call His name JESUS. 32 He will be great and He will be called 'Son of the Most High.' And the Lord God will give Him the throne of His forefather David; 33 and He will be King over the House of Jacob for the Ages, and of His Kingdom there will be no end." crying out in a loud voice, "What hast Thou to do with me, Jesus, Son of God Most High? In God's name I implore Thee not to torment me." I indeed am baptizing you in water on a profession of repentance; but He who is coming after me is mightier than I: His sandals I am not worthy to carry for a moment; He will baptize you in the Holy Spirit and in fire. The Queen of the south will awake at the Judgement together with the present generation, and will condemn it; because she came from the ends of the earth to hear the wisdom of Solomon, and mark! there is One greater than Solomon here. But He remained silent, and gave no reply. A second time the High Priest questioned Him. "Are you the Christ, the Son of the Blessed One?" he said. he answered the question by saying to them all, "As for me, I am baptizing you with water, but One mightier than I is coming, whose very sandal-strap I am not worthy to unfasten: He will baptize you in the Holy Spirit and with fire. Nevertheless love your enemies, be beneficent; and lend without hoping for any repayment. Then your recompense shall be great, and you will be sons of the Most High; for He is kind to the ungrateful and wicked. For just as the Father awakens the dead and gives them life, so the Son also gives life to whom He wills. The crowd answered Him, "We have heard out of the Law that the Christ remains for ever. In what sense do you say that the Son of Man must be lifted up? Who is that Son of Man?" She kept following close behind Paul and the rest of us, crying aloud, "These men are the bondservants of the Most High God, and are proclaiming to you the way of salvation."